A memorial event was held in Georgetown March 29 to commemorate the lives lost in the Vietnam War. 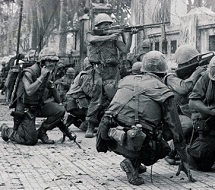 This date was officially declared National Vietnam Veterans Day and United States Holiday, originally set forth by President Richard Nixon in 1974 but was not officially recognized until President Barack Obama declared this date in 2012 to commemorate the 50th anniversary of the last troops leaving Vietnam to return to the United States. This day was officially declared a national holiday by President Donald Trump in 2017 through the Vietnam War Veterans Recognition Act. Many servicemen and women, Vietnam veterans, family and friends of fallen soldiers, and community members came together to pay their respects to all those who have given their lives fighting for the country, not only in Vietnam but in all U.S. conflicts. The event was organized by the Vietnam Veterans of America, Chapter 1105, based in Lewes. “Thank you all for being here to remember the fallen. Today we honor all veterans,” said Robert P. Corsa, a Vietnam veteran who welcomed all in attendance. The ceremony started with Presentation of the Colors by the Sussex Central High School JROTC Color Guard. Robert Knight, a Vietnam veteran, then led the crowd in the Pledge of Allegiance which was followed by a rendition of the national anthem sung by Cadet Patricia Diaz. Chaplain and Colonel Charles E. Covington Sr. gave the opening invocation. Following the invocation, Joe A. Moore, a retired colonel in the U.S. Army gave way to former Sen. George H. Bunting Jr.
“Today we recognize all of those who have passed in the Vietnam War. It is our duty to be vigilant citizens and veterans by making sure these names and stories are never forgotten. We hope that we can continue to have this vital ceremony in Georgetown every year from here on out. As a community, and citizens of the United States we strive to leave no one behind; whether in life, war, or remembrance,” said Bunting. Following Bunting’s address, Bruce Garber spoke about the Vietnam War and put things into perspective with statistics and background history regarding this newly implemented national holiday. Garber explained that in this conflict, 304,000 people were wounded, and over 270,000 veterans suffer from PTSD due to the nature of the war. He even mentioned that 1600 soldiers are still considered Missing in Action, four of which are from Delaware. Afterwards, the SCHS JROTC cadets read 98 names of veterans who had died in combat from New Castle and Kent counties. Sussex County veterans’ names, which are inscribed in a monument that was dedicated in 2004 in Georgetown which was made possible by the fundraising by members of Chapter 546 of the VAA, were then read to the crowd with information on their rank, position, hometown, age, branch, and cause of death.